It looks very full and I’ve been waiting to give it a clean up for a long time now but did not want to rush the process. All good things come to those who wait. 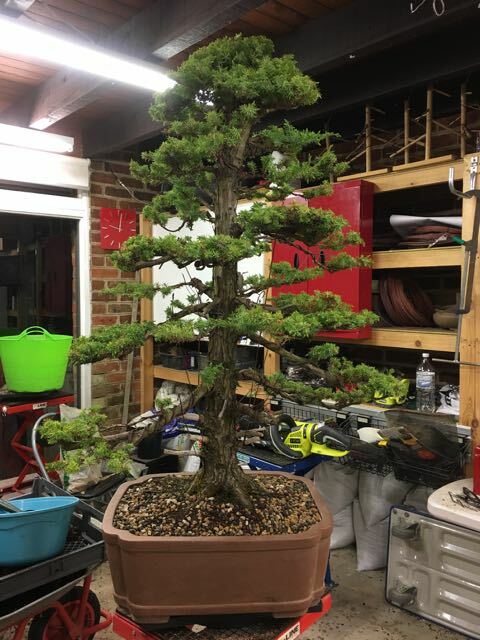 I am really pleased at the volume of foliage this tree has now but not so keen on the sharpness of the needles. All work was performed using scissors and tweezers so it’s not so bad. The foliage that had grown had some scale as well as needle and it was pointed out to me that it may be a Juniperus foemina. This may well be as this scale foliage has only occurred in this growing season. Just to see how far this tree has come, here is a photo from July 2015 showing how the tree was purchased. 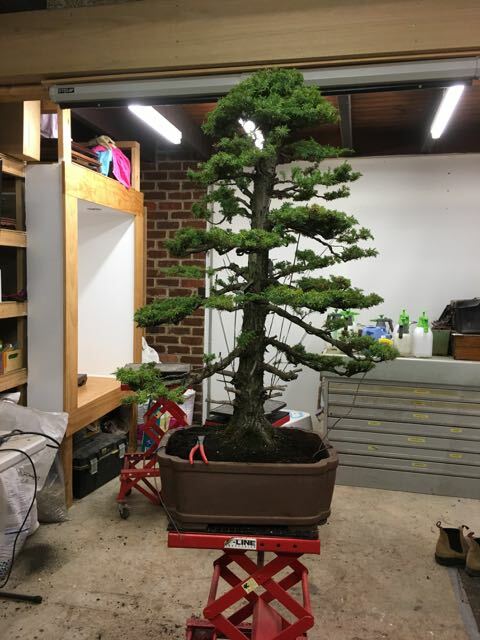 It just reinforces my belief that to develop good bonsai you just cannot rush the process. Correct actions taken at the right time will end in a better bonsai. It’s only been one year since this tree was repotted and I wanted to inspect the root growth after my feeding regime and the open mix that was used at last repot. 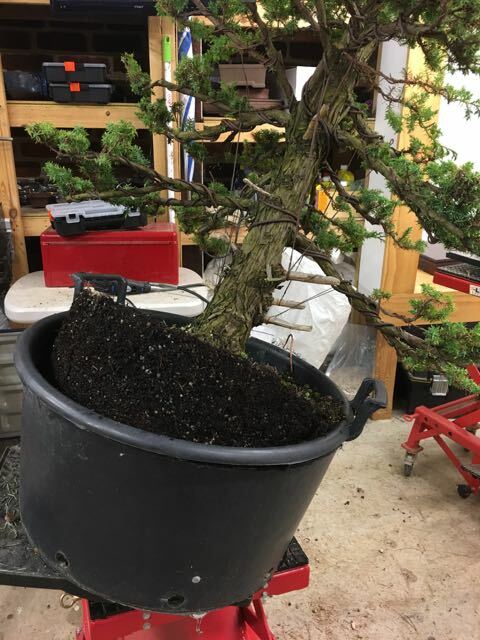 It was becoming difficult to water due to the density of the roots and I’m aware repotting this soon may encourage more coarse growth than if it was left but my focus is still on the roots and ensuring this pine is as strong as it possibly can be. There was a lot of roots and they had just woken from dormancy so the timing was perfect. There was lots and lots of mycorrhiza too which always puts a smile on my dial. I changed the pot as well. And the end result. Now the plan is to work on the ramification and structure of the tree. The roots are just where I like them. It’s the start of the repotting season here in Melbourne, Australia and also time for an update on this Trident Maple Bonsai. The root mass has become quite dense and I’m pleased with the development of the roots. I find repotting very satisfying and shows the rewards of the care you give your trees. Here’s the view when it was removed from the pot. Plenty of roots! It is always pleasing to see a mass of fine feeder roots. On my last trip to Japan I purchased a pot with this tree in mind. It’s got really nice patina and will be perfect for the tree as it continues to develop. The maker is Hattori. So another step taken in the development of this Trident Maple! 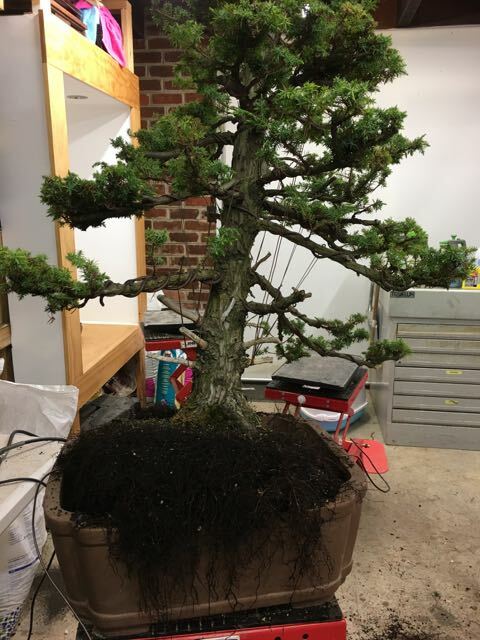 So this Japanese Black Pine has had plenty of time for recuperation and to develop a solid root structure. It’s been well fed and left to just build its overall strength and vitality. There is a lot of mycorrhiza visible just below the soil surface so everything looks like it’s heading in the right direction. I have been very keen to get into this one and do the initial structural wiring but I’ve held back…until now. Here’s the tree as it came of the bench. There were 3 sacrifice branches that were allowed to run and increase vigour. These will be removed as I’m a little concerned that the tree is putting all it’s energy into the sacrificial growth and not the remaining buds. The wound at the back of the trunk has been healing well and it was reactivated and covered with wound putty again. The snails had eaten the last lot! So the first job was to prune unnecessary buds and branches and remove old needles and just balance the energy of the tree. The trunk still impresses me and gives me hope. 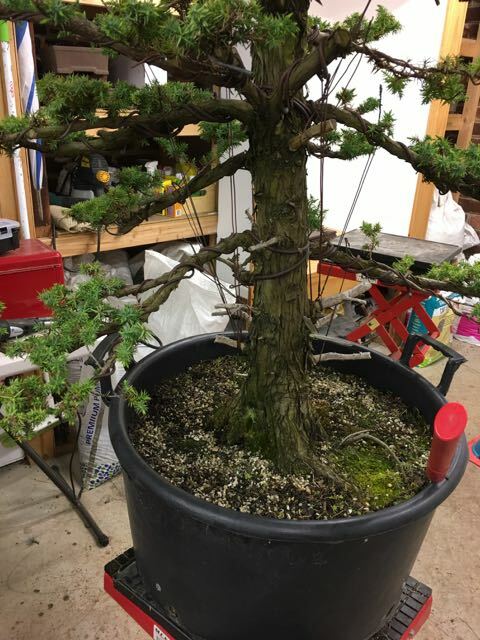 Warts and all, this is the initial rough wiring of this bonsai. Keep in mind, this is not show wiring but ‘setting the bones’ for the future. I’m really pleased with how it is progressing and even though it has been a long, patient journey, that’s what it is, a journey. The time has come to put this Tosho Needle Juniper Bonsai into a bonsai pot for the first time. Enough time has passed since any work has been carried out and the tree is very healthy. Obviously the first job was to remove the tree from the nursery pot. It was jammed in there nice and tight so I knew there’d be plenty of roots. The tree is so tall and generally big that I needed to work the roots on a low barrow. First inspection of the roots showed very promising results. There were no thick roots and plenty of the fine feeder roots. I deliberately selected a first training pot that would not mean a massive reduction in the root mass to help with the transition from the plastic nursery pot. I want to minimise the shock as much as possible and this first pot is not the forever pot. Further reduction can occur at a future repotting session. Checking for size. You can see the fine feeder roots. The tree was then secured into the pot. Then the mix was added and worked into the pot using a chopstick.  The surface was covered with sphagnum moss and thoroughly watered. And ta-da! Done. 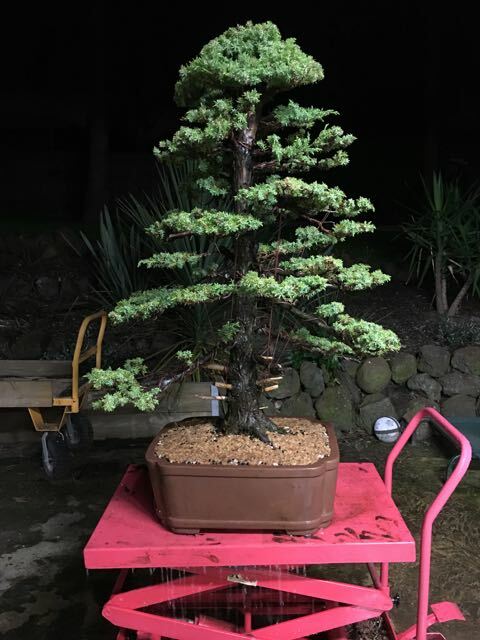 I’m really happy with the progress of this Tosho. The pads are starting to form on multiple levels and there is still more work to be done on the shari and deadwood but that will come. For now it’s shelter for 3-4 weeks with minimal exposure to the elements then feeding heavily. Well it’s been 3 years since I first acquired this tree and repotted it with the only focus being on the strength of the roots and overall health of the tree. Sometimes you just cannot rush; patience really is a virtue. Initially the tree was removed from the pot. The roots had grown so thick and dense that it took quite some effort to free the tree. The akadama that was in the mix had broken down as it does, and a repot it due. The roots that had developed were very pleasing to see. The roots were pruned, and the nebari corrected in a few minor places then the tree was secured back into the same pot. I like this pot as it’s an old one that was purchased on a trip to Osaka and the style suits this tree. The mix was worked into the pot and then levelled. Sphagnum moss was chopped and put on top. The lower trunk is one of the most pleasing features of this tree. 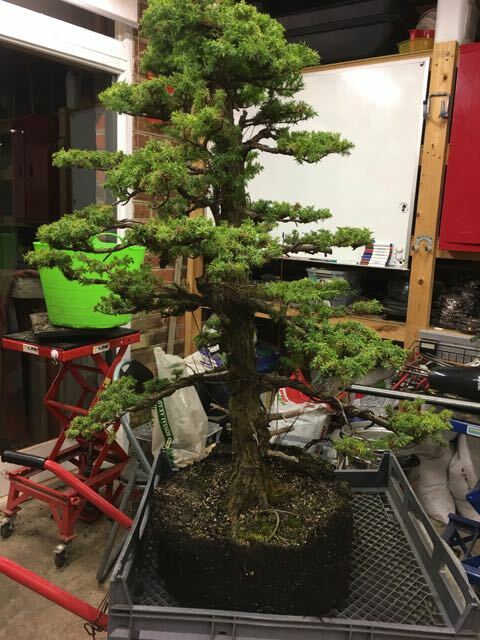 The age is really starting to show and makes the work that goes into this bonsai all worth it. The tree was tilted to the left to enhance the first movement on the lower trunk and to also make the second bend less horizontal. It also brings the apex back over the centre of the nebari. The tree was also rotated slightly clockwise in the pot so the apex is now leaning forward a little more. You can see from these photos that the tree is looking far more vigorous now and a nicer shade of green (as opposed to yellow). The tree still hasn’t been wired and depending on the spring growth, this may be on the cards for summer when the tree is decandled. Or, it might just wait until autumn next year. No rush. That’s why this is a project and not just a styling. When I was out watering the trees this morning I had a closer look at this one and was pleasantly surprised to a heap of new growth and buds starting to appear. Well it’s taken quite some time and a few blood transfusions but the initial first rough styling is done. The main task at this point is to bring down the branches which are all quite thick. So heavy copper wire and guy wires have been used. There was no need for raffia and there were no tears or breaks. So here’s a refresher of where the tree was before any work was done. And here it is after. There is still a very, very long way to go but it’s a great first step. The lowest right hand branch may be removed but my concern is the branch above it on the right side points to the rear of the tree so it will have to wait for the next session. A lot of the Tosho I’ve seen have large areas of shari but I’m not sure that will be the case with this tree. I’m not ruling it out but I really like the lower trunk and the flakey bark it has developed. Time for a rest, good feed and some recovery. Oh, and one lesson I’ve learned with the initial styling of a Needle Juniper…wear long sleeves. Tosho or Needle Juniper Bonsai are not very common in Australia, well not as common as they are in Japan so when I came across this one recently (July 2015) I snapped it up. 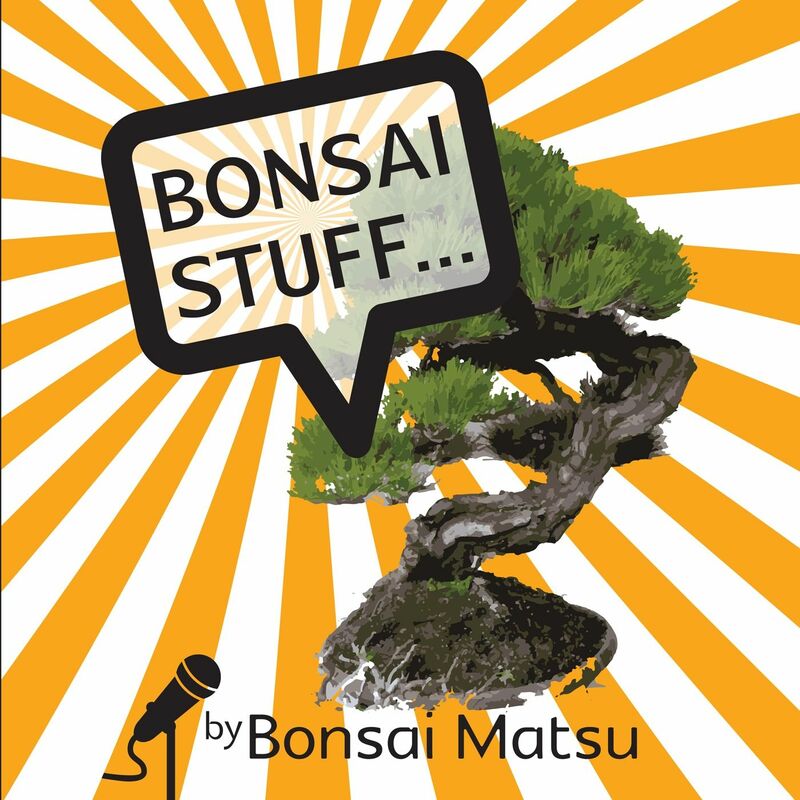 It’s been field grown for 15-20 years by a bonsai professional and is in fantastic health. Here’s how the tree was when purchased. As it is here it stands approximately 1.3m tall from the soil surface. It was well fed and the root mass feels very solid now so leaving the tree alone has done it wonders in regaining its vigour. With Spring upon us, the candles have just started to move and I’m looking forward to a good result with decandling in Summer. You can see from the above pic that the fertilisers bags were left on over winter. I do this with the weaker trees if they are not being repotted. I did intend to repot this tree but that can wait another year. Changing the angle to improve the appearance can come later. For now it all about the growth!